Starting to exercise is difficult wherever you are in life. We lead by and large easy, comfortable lives where we just don’t need to do what our ancestors did. Our ancestors had to go out and hunt and gather our food, but we can just go to the shops, or even have food delivered to our doorsteps. Where our ancestors had to run from and fight dangerous wild animals, we live safely in houses in cities. Our ancestors had to walk for days to see each other, but we can get in our cars or hop on the bus, or, if we don’t feel up to it, we can just call people instead. But just because we don’t need to do all this exercise any more doesn’t mean our bodies don’t need it. Physically, we’re still cavemen, and our bodies expect exercise. That is why we can become obese, depressed, and lose all our energy and motivation when we stop exercising. Even modern tribespeople in their sixties, seventies, and beyond are out there hunting and walking and carrying heavy weights. No matter how old you are, your body wants to exercise. So what happens when we haven’t worked out since we were about twelve? The bad news is that the longer you go without exercising, the longer it will take you to get much good at it and to gain full benefits from it. The good news is that it only takes a month to develop a new habit, and that you will start experiencing some benefits mere weeks into your new workout regime. To start off, pick a sort of exercise that you will enjoy. Everyone has different interests, abilities, and motivations. Feel free to check out some of our other articles for motivation and inspiration. Maybe you will pick one sort of exercise to start off with, maybe you will choose to try out every sort of exercise that is available to you right now and pick the best from among them, or maybe you will pick one cardio, one resistance, and one endurance activity, and just stick with them for all round benefits. Once you have chosen your exercise, try and write up a schedule you can stick to. Many people fall down here, because they get too ambitious and write up a schedule that even an Olympic athlete would struggle with. The trick is to be realistic, but push yourself a little. You need to make sure that any time you write an exercise into the schedule you can definitely be there to do it. There may be the odd day where you’re pressed for time, feeling unwell, or even forget. But when you write it down, there can be no doubt in your mind that, based on what you know, that time slot is free. And pushing yourself? If last time you exercised for half an hour, this time allocate yourself forty five minutes. Or if last time it took you twenty minutes to complete a run, this time try and do it in fifteen. 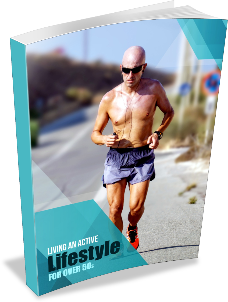 Finally, keep track of your exercise regime, as well as your diet. Many people who start exercising will feel suddenly hungry and overeat junk foods, gaining weight and growing lethargic. Try and eat a healthy, balanced diet, rich in protein to fuel your new activities. And try and follow what exercises you do, how long they take you, and how you feel afterwards. Seeing your own progress is the best motivator there is! And that’s how to get into exercise when you are over the age of fifty. It might feel tough at first, but bit by bit your body will get used to it, soon you will start to expect and enjoy it, and before long you will be reaping the rewards of giving your caveman body the daily exercise it needs!